May 19, 2017 By Tina M 4 Comments This post may contain affiliate links. Read my disclosure policy here. I LOVE summer. I love the warmth. I love 4th of July. And I love playing outside with my kids. However, a creative summer schedule for fun summer activities is the difference between a great summer, and a summer of chaos…. for us. Having a creative summer schedule doesn’t mean everything is strict and always planned out and there’s no flexibility…quite the opposite! Our summer schedule gives us guidance and inspiration so that we make sure we are making every day of the summer count! 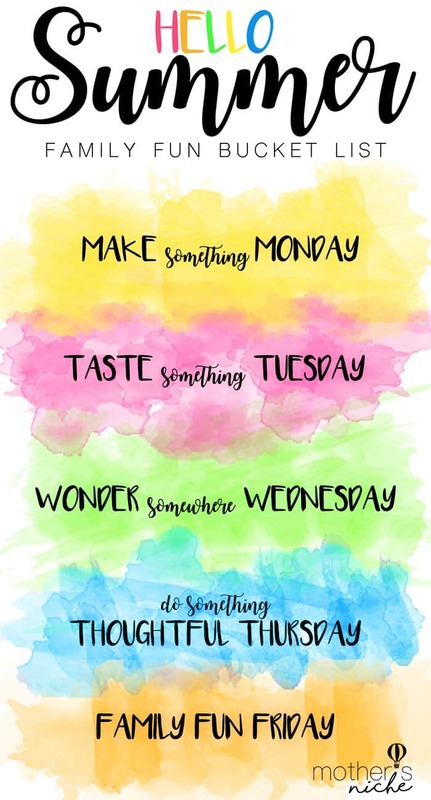 Make Something Monday: Make slime, do a fun science experiment, do a craft, learn a new talent (how to make _____). Taste Something Tuesday: This day for for cooking in the kitchen, going to a farmer’s market, or maybe even ice cream or shaved ice! Wander Somewhere Wednesday: Maybe we don’t always leave the house, but on Wednesdays we try to make it a point to do so. Our summer schedule will try to accommodate going on some kind of adventures on Wednesdays, whether it’s to the pool, the park, or just to grandma’s! Thoughtful Thursday: I have always felt it important to teach my children the joy that comes to one’s life when you are doing something kind for someone else. Thursday is the day for this! Maybe we visit the elderly, do some weeding, make someone treats, or simply return extra grocery carts to their stall. Whatever it is, it’s joyful and rewarding and my kids start to learn the important things in life: Like how life doesn’t always revolve around their own wants and needs. Family Fun Friday: Family fun Friday is pretty easy to plan because so many things can fit into this category, but we try to save the things that the kids are looking forward to the most, and we try to include dad when we can! These are the nights we look at the stars, have movie nights, go bike riding, eat picnic dinners, or maybe go camping or on a little weekend getaway of some sort! For fun summer ideas, check out our Summer Fun Bucket List from last year! We hope you enjoyed our family’s summer schedule! I hope you will share you fun summer activity ideas with me! This is SO fun. And I am totally like this. I need to have a plan or else the summer will be over and we will have done nothing! The photo says wonder not wander. I love this!! A great mix of routine and trying new things!! I’ll have to implement a couple of these with my kids. I love this! It is the pretties printable for the daily summer ideas I have ever seen. By any chance do you have a printable copy of it that says Wander instead of Wonder? I love the water colors behind it, it is just gorgeous!! Thank you so much for your darling ideas! !